It is claimed that Stoke Ramblers was formed in 1863 when former pupils of Charterhouse School formed a football club while apprentices at the North Staffordshire Railway works in Stoke-on-Trent. However, Stoke Ramblers' first documented match was five years later, on 17 October 1868, at the club's original home, the Victoria Cricket Club ground and any earlier history is based on supposition. Played against an E.W. May XV club, the 15-a-side match ended in a 1–1 draw. In the game, the club's first goal was scored by Henry Almond, Stoke's founder and captain. In 1875, to cope with rising attendances, the club switched to a ground at Sweetings Field, not far from the Victoria Cricket Ground. At this time, the only fixtures were friendly matches; this changed in 1877 when the Staffordshire Football Association was formed and created a new competition, the County Cup, which Stoke won in the inaugural season, beating Talke Rangers 1–0 in the final. In an earlier round, Stoke had recorded what is still the club's record victory, a 26–0 triumph over Mow Cop. Stoke retained the County Cup in the following season with a 2–1 win over Cobridge and established themselves as the largest club in the area. In 1878, the club merged with Stoke Victoria Athletic Club and became known as Stoke Football Club. They moved from Sweetings Field to the Athletic Club ground, which soon became known as the Victoria Ground. It was around this time that the club adopted their red and white striped kit. Stoke entered the newly formed Birmingham Association Cup in 1881, although they were beaten 8–0 by Aston Villa in the first round. In the 1882–1883 season, Stoke reached the final of the Staffordshire Senior Cup but were beaten 3–2 by West Bromwich Albion. The club decided to enter the FA Cup for the first time in the 1883–84 season; the competition itself had been founded 12 years earlier. Stoke became one of the twelve founding members of the Football League in 1888. Stoke's manager, Harry Lockett, represented the club at a meeting in London, where the league's formation was discussed. Lockett played an instrumental role in its inception and became the league's first secretary; however he resigned from his role of manager in August 1890, in order to concentrate on his league responsibilities. Stoke struggled in their first two seasons in the league, 1888–89 and 1889–90, finishing in last place on both occasions. The club failed to secure re-election to the league at the end of its second season, instead being replaced by Sunderland. As a consequence, Stoke started 1890–91 in the Football Alliance; they finished the season as champions. The Football League was expanded to include fourteen clubs in 1891–92, which ensured Stoke were re-elected to the league, where they remained for the rest of the decade. The 1930s saw the début of the club's most celebrated player, Stanley Matthews. Matthews, who grew up in Hanley, was an apprentice at the club and made his first appearance, aged 17, in March 1932 against Bury. 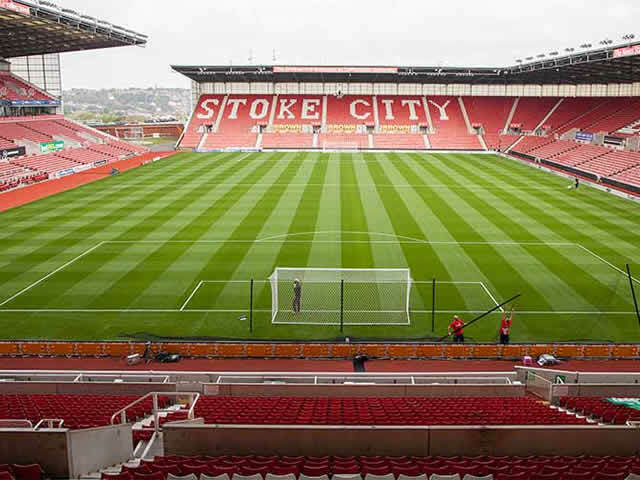 The 1997–98 season saw Stoke move to its new ground, the 28,000 all-seater Britannia Stadium, after 119 years at the Victoria Ground, the longest time spent at a ground by any team in Britain. It is not clear where Stoke's original playing fields were located. Their first pitch was certainly in the site of a present burial ground in Lonsdale Street, although there is evidence that they also played on land near to the Copeland Arms public house on Campbell Road. In 1875 they moved to Sweetings Field, which was owned by the mayor of Stoke, Alderman Sweeting. It is estimated that as many as 200–250 spectators were attending home matches at Sweetings Field, paying one penny for admission. The first match to be played at the Victoria Ground was a friendly against Talke Rangers in the 28 March 1878; Stoke won 1–0 in front of 2,500 fans. The ground was originally an oval shape to cater for athletics, and this shape was retained for the next 30 years. Major development work began in the 1920s, and by 1930 the ground had lost its original shape. By 1935 the ground capacity was up to the 50,000 mark. A record crowd of 51,380 packed into the Ground on 29 March 1937 to watch a league game against Arsenal. They accommodate home and away supporters who are wheelchair users (subject to availability) and these bays have ground level access. To allow easy access into the stadium, entry for wheelchair disabled supporters will be via the specified gates meaning supporters do not enter through the turnstiles. There is no allocated seating for blind and partially sighted supporters within the stadium but please note that you would need to be able to exit the stadium quickly and safely in an emergency. They welcome disabled supporters using an assistance dog. Please let them know, when purchasing tickets, that you will be accompanied by an assistance dog when attending matches. There is a small area between the Q-railing Stand and the Boothen End that is suitable for exercising your dog if required. Matchday commentary is available using a SCFC headset, please specify any requirement when booking your tickets or by sending an e-mail to Michelle Whittaker at michelle.whittaker@stokecityfc.com . Once they have seen confirmation of DLA or PIP they offer a discounted price for disabled supporters with a complimentary ticket for a personal assistant. Tours of the Britannia Stadium are available throughout the week and give supporters full access to rooms and suites that most will have never seen before. They include visits to the first team dressing rooms, executive boxes, the Sir Stanley Matthews Lounge, pitchside (including dugouts) and many other special parts of the stadium. Tours last approximately 45 minutes, are subject to availability and have to booked two weeks prior to a visit. 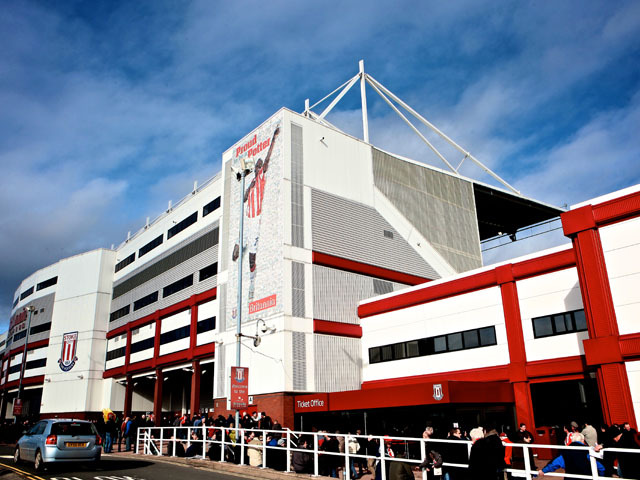 Transport: Stoke-on-Trent (National) 2 miles - shuttle buses on matchdays. Bus Routes: 20 stops at the stadium. Stadium Tours: Available upon booking in advance.